Is there such a thing as cheap ski weekend? After all, how can you go skiing for 3 or 4 nights without breaking the bank? The simple answer to this conundrum is for you to call us and let us do the rest. We have been selling ski holidays for 25 years so we have the knowledge to help you. The earlier we book your flights the cheaper the price should be. Airlines operate a fluid pricing policy whereby the earlier you book your flights the cheaper the price is. Given that the return flights from the Alps back to the UK on Sunday nights are very much in demand it is advisable to book at least 6 months in advance of travelling. There is definitely a hierarchy of ski resorts in the Alps, with the best resorts commanding the highest prices. Of course you can always spend a few nights in a top quality resort without having to ask your bank manager for a loan so long as you stay in a youth hostel or a pension style hotel. However, if you are willing to compromise a little on the quality of your ski resort you can stay in good quality accommodation and still enjoy a great value ski weekend. 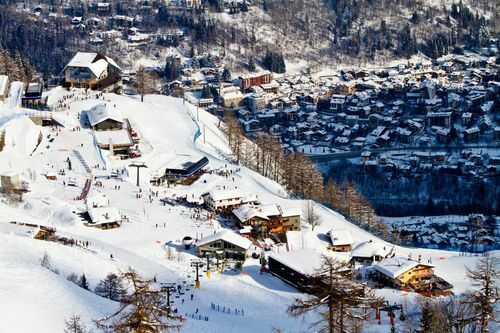 Italy is the cheapest country in which to take an enjoyable ski weekend. Ski passes, ski hire and eating out are all cheaper in Italy compared to other Alpine countries. Furthermore, there are plenty of great Italian ski resorts within reach of suitably close airports. The prices below are based on a 3 night bed and breakfast stay (sharing a twin/double room) including scheduled flights and private taxi transfers for weekends in January 2018. The easiest and most cost effective way to book a cheap ski weekend is to start your research early and book early. In fact the earlier the better. Call us and we can recommend some cracking resorts for a cheap ski weekend to remember.